Henry was born in Newbury on the 25th June 1886, the second son of William Pious Ellaway and his wife Rose. Pious (sometimes Pius) was a labourer, originally from East Hendred, who married Rose Rushen from Bucklebury in 1883. At the time of the marriage Rose already had a child, Kate Amelia , and the couple’s first child, Frederick William, arrived in early 1884. Following Henry’s birth in 1886 there were three more additions to the family: Ellen (born 1888), Sydney Charles (1891) and Elsie May (1897). In 1888 the family moved to 3 Bedford Place, an alley of run down housing off Bartholomew Street (now demolished - the site is car parking behind Maidenhead House). Local directories give the occupant of this address as W Ellaway in 1889 and then, from 1890 to 1901 as P Allaway. In 1901 they moved, possibly to 3 Chestnut Court, though they don’t appear in a directory entry there until 1904. In 1906 the coverage of these off-street courts and yards in the local directory is much reduced and the Ellaways disappear from view until 1911 when Rose is the head of household at 2 Smith’s Buildings in Marsh Road. Smith’s Buildings were a group of cottages on the corner of Marsh Lane and Marsh Road (which became Park Way). The site is now part of the Parkway shopping centre; prior to that development the site of the cottages was parking in front of a hand car-wash operation in the old Newbury Brewery malthouse. Rose was head of household in both the 1901 and 1911 census returns for the family in Newbury; in 1901 this was because Pious and his eldest son, Frederick, were working away from home and lodging in London (30 Hanover Street). This was not the case in 1911 for Pious died in Newbury 1905; he was buried on 27 April in Newtown Road Cemetery. Henry found employment on the Kennet & Avon Canal, working as a boatman, which may have whetted his appetite for a life afloat. On 12 October 1906 he joined the Royal Navy, signing up for a 12 year engagement, five serving in uniform followed by seven in the Royal Navy Reserve. On his service record he was described as being 5ft 9¾in, with brown hair, hazel eyes and fresh complexion, he also had a tattoo of a pick and shovel on his right arm. At the time most ships were steam driven which required a lot of coal, and a lot of men to shovel it into the boilers or simply from place to place in order to maintain the balance of the ship. This was the work that Henry found himself doing as a Stoker, first on an old stoker training ship, the Nelson, then on a succession of cruisers: HMSs Grafton, Euryalus, Goliath and Jupiter followed by the pre-dreadnought battleship HMS Britannia before being transferred to the reserve on 9 October 1911 at the end of his five year stint at sea. The Admiralty evidently foresaw the coming of war for they called up Henry (and, no doubt, many more) in July 1914. On 12 July 1914 he was posted to HMS Good Hope, an aging Drake-class cruiser that was also being returned to service from the Reserve Fleet. The Good Hope left Portsmouth on 2 August 1914 to join Admiral Cradock’s 4th Cruiser Squadron operating off North America and the West Indies. The Admiralty mistakenly believed that German transatlantic liners carried guns in their holds which would be installed to convert them into armed merchant cruisers and wanted a force in the region to counter this perceived threat. When the Good Hope joined his squadron Admiral Cradock transferred his flag to her because she was the fastest cruiser in the squadron - despite the fact that her crew (including a large number reservists like Henry) had not had the time to become an efficient team. Soon it was evident that the real threat was not from German liners but lay further south where a German squadron under Admiral Graf Spee was raiding allied shipping. Cradock set off in pursuit of Graf Spee. The two squadrons met at Coronel off the coast of Chile on 1 November 1914. Cradock’s force was outmatched by the far more modern German cruisers and suffered heavy losses. The Good Hope was sunk by the Scharnhorst and Gneisenau along with HMS Monmouth – both British cruisers went down with all hands. Henry died with the Good Hope, along with Admiral Cradock and another Newbury lad, Sydney Smith a Royal Marine from Speenhamland. The battlecruisers Invincible and Inflexible were despatched from England under the command of Admiral Sturdee to reinforce the remnants of the British cruiser squadron. They caught up with Graf Spee on 8 December 1914. This time the advantage was with the larger British ships, who sank the Scharnhörst and Gneisenau while the lighter cruisers from the two squadrons had their own fight. One German cruiser, the Dresden, escaped, along with a single collier; the remainder of the German squadron (the cruisers Nürmberg and Leipzig and colliers Baden and Santa Isabel), were sunk with massive casualties. The action is known as the Battle of the Falkland Islands . It is to be feared that there were several local young men on board the “Good Hope” which is now presumed to have been sunk off the Chilean Coast. Two at least are included in the Newbury list, Stoker A.H.Ellaway, Victoria Park, and Pte W.S Smith, late of Speenhamland. 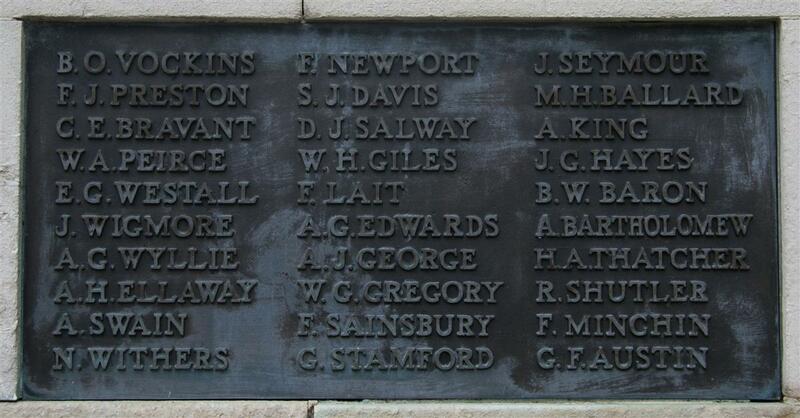 Henry is remembered on panel 4 of the Portsmouth Naval Memorial. Locally he is commemorated on Tablet 4 of the Newbury Town War Memorial., the parish memorial board and roll of honour (in both cases incorrectly as W H Ellaway) in St Nicolas’ Church. Henry’s brothers Frederick and Sydney were both engine drivers, not on the railway but road engines. Their skill was much in demand by the Army Service Corps and the Royal Engineers, both of which used thousands of traction engines to haul loads, maintain roads (steam rollers), etc. Frederick was snapped up by the ASC and served in one of their Motor Transport companies as a Private (M2/177380). There is no record of Sydney following the same path; it is possible that he served in the Coldstream Guards (Private 16995), though that could be another Sydney C Ellaway. The war brought tragedy to all parts of the country, all parts of Newbury; but it also brought some good things. Henry’s little sister, Elsie May, met her husband, Solomon McIntosh, very possibly while he was billeted in Newbury, where they married in Newbury in 1916. After the war they moved to Solomon’s native Lanarkshire. It is thought that Solomon served in the Royal Garrison Artillery. Thanks to Karen Newbery for her help researching this sailor.